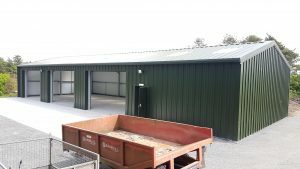 The Newest Shed in Town! A fantastic new addition to the RBG Logan estate facilities was handed over in April. The new tractor and storage shed takes pride of place atop the high ground at the garden and will provide secure, dry and clean accommodation for the essential vehicles and equipment utilised at the Garden. 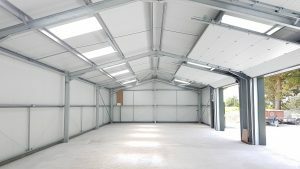 The building measures 24 x 9 metres and is arranged in four zones; three with electrically operated 3 metre high roller doors and one with pedestrian access. The building is constructed with a galvanized steel superstructure on a reinforced concrete base, clad with insulated steel sheeting. It also incorporates skylight sections in the roof to provide natural light. The design was produced by the team at Logan to meet their specific needs and the construction was undertaken by Archibald’s Ltd, a local company, who were awarded the contract after a competitive tender process. The planning and warrant applications were supported by Hardies Building Surveyors who are RBGE’s framework consultants and assist with our construction projects. The construction team work closely and effectively with the team at Logan on a day to day basis to minimize disruption to daily activities and visitors and to ensure site safety at all times. The project was delivered within a very tight budget and to a high standard within the financial year deadline.